Welcome to Green Lotus Saksham creates a perfect blend of luxury and our responsibility towards the environment. Nestled amidst greenery, this green residential project provides an entirely different living experience that promotes eco-sustainability. It includes, 3BHK, 3+1BHK, 4BHK and 5BHK Apartments and penthouses in Zirakpur that offers plush and elegant living. Optimized energy usage with energy efficient appliances, heat reflective glasses, etc. 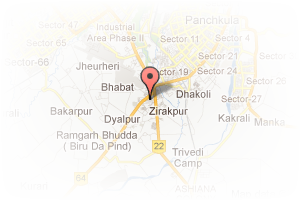 Address: sco 14, patiala zirakpur road, Patiala Road, Zirakpur, Chandigarh, India. This Builder Profile page for "Sony Realtors" has been created by PropertyWala.com. 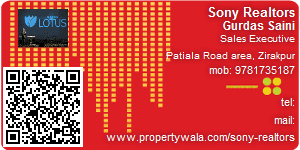 "Sony Realtors" is not endorsed by or affiliated with PropertyWala.com. For questions regarding Builder Profiles on PropertyWala.com please contact us.